It’s that time of year again – time for pie! One of my favorite things about Thanksgiving are the pies – pecan, pumpkin, apple, or whatever flavor happens to be served. I’ll admit it – I love pie. So that got me thinking about serving pie at a wedding reception. 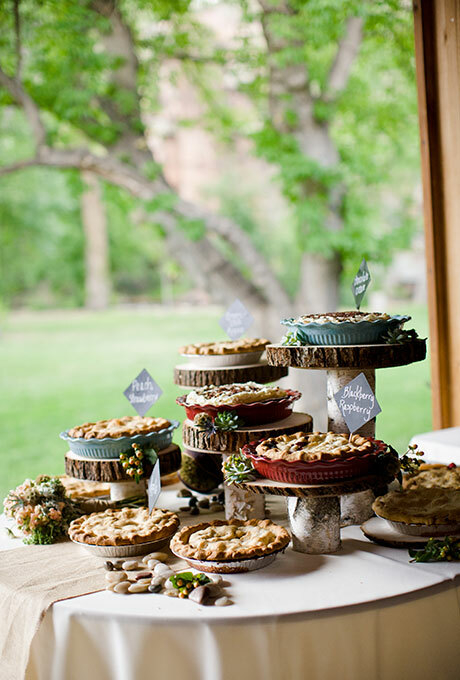 It seems like a great idea – instead of serving the traditional cake why not give your guests something different like pie! If your wedding is close to Thanksgiving you could go the “traditional pie route” and offer pecan and pumpkin. Or you could get crazy and creative and have your baker come up with several different flavors of pie. You could choose a few favorites and your soon-to-be-spouse could choose a few too. Then the pies are set up as a dessert bar and everyone can sample a little bit of whatever flavors they love. You can check out this pie idea here.